And my sadness dies too. 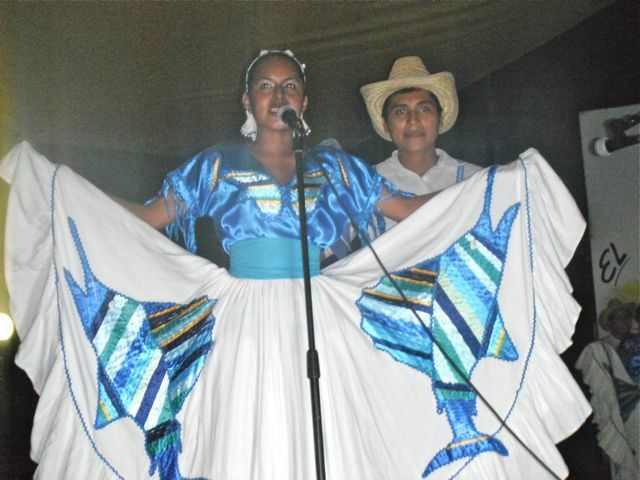 The chilena is the music most identified with the coast of Oaxaca and Guerrero. As the name implies, it originated in Chile, where it is known as the cueca. But its roots might also be found in Peru where it is called the marinera. Historians believe that the chilena arrived in Acapulco during the colonial period with the maritime trade between Chile, Peru and Mexico. It became popular in 1821 when the Chilean liberator, Bernardo O’Higgins, sent a ship full of soldiers to Acapulco to help general Vicente Guerrero fight the war for Mexican Independence. As it happened, independence had already been achieved by the time the Araucano arrived in December of that year. The crew and the soldiers got to spend their time partying and thus spreading the chilena throughout the Costa Chica. The third introduction of the chilena by Chilean sailors was during the California Gold Rush of 1848-1855. 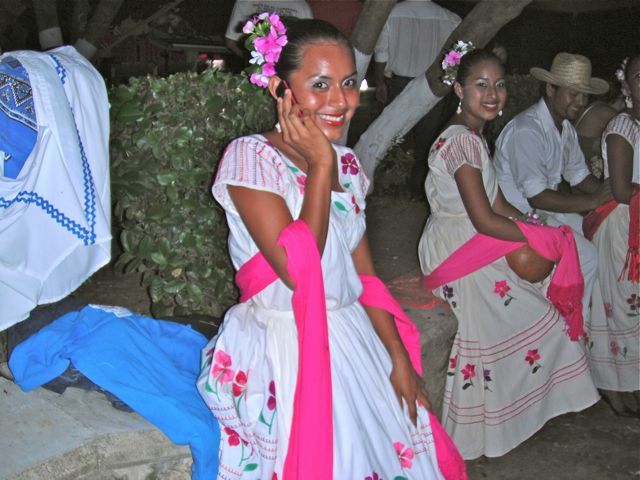 According to popular legend, a Chilean ship ran aground on the Oaxaca coast and the crew taught the natives of the region their songs and dances. 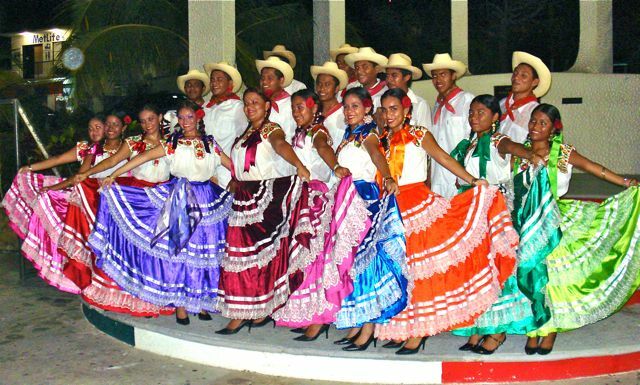 Over the course of time, the rhythm got its immigration papers and evolved into something completely different from the cueca. 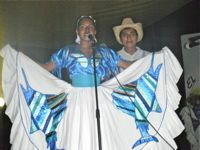 Generally, the chilena has a 6/8 beat and the music alternates with spoken verses. The words usually focus on love, women, the region (la patria chica), or local traditions. It’s typical for ribald couplets to be introduced between the refrains. 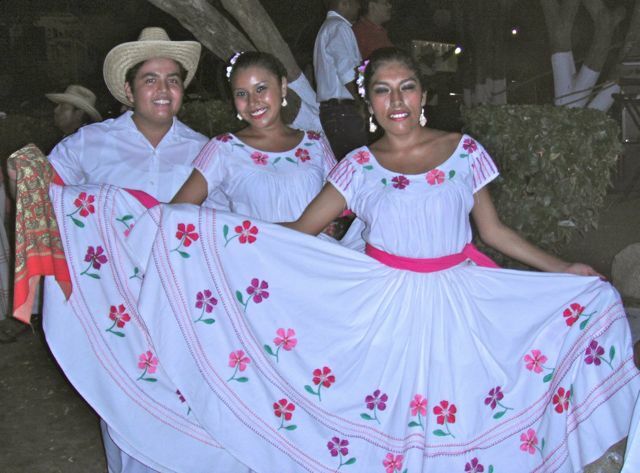 The costumes of the dancers vary, but the men tend to wear white shirts and trousers, a straw hat, and a bandana. They wave a handkerchief to mark their movements. The women dress in white blouses embroidered with beads. Wide, ankle or calf-length skirts of different colors are embellished with lace and ribbons with a silk kerchief in the waistband. Chilenas can also be purely instrumental. In this case it is like son but with a more energetic, foot stomping rhythm from start to finish. The music may be performed by violins, guitars, brass and percussion. The rhythm is unique to the coast, but different places have their own special way of interpreting the dance. It may begin with a procession accompanied by foot stomping, or the stomping may continue from start to finish. We who have been born and raised in this beautiful little piece of our country cannot help but be overcome with feelings of indescribable joy when we hear the notes of a chilena while we unconsciously tap our feet to the rhythm of this rousing music. Puerto Escondido was represented for the first time ever at the Guelaguetza in Oaxaca this July with chilenas performed by Shini ñuu (Chatino for "Head of the People"). Formed in 2002, Shini ñuu is dedicated to creating a unique cultural identity for Puerto that incorporates the customs and tradition of the Oaxaca coast. 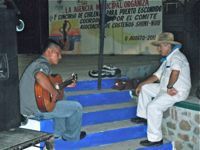 In August it sponsored the Fandango de la Costa at the Agencia Municipal in which bands competed for a 10,000 peso prize for the best chilena about Puerto Escondido. Shini ñuu also sponsors events featuring local crafts and cuisine. For more information, Google: Shini ñuu.